Create Your Free Online Store In India: Online Grocery: Why it’s a Great Opportunity? Why it’s Still Nascent? Online Grocery: Why it’s a Great Opportunity? Why it’s Still Nascent? According to a recent report by worldmart.in, online grocery excluding fresh products shall grow 47% and hit USD 36 billion globally by 2016, with a high growth in Asian markets. Globally, grocery retail chains are doing a great job online, by providing seamless omni-channel experience to customers with price advantage and convenience. And needless to say the opportunity is very large in Indian market, also provided grocery retailers, both online and omni-channel, look for a long term opportunity and not a short term play.Unlike other ecommerce categories, online grocery stores require large investments, deeper technology and complex supply chain. Hence it does not pose a wide startup opportunity. India has still seen an advent of many online grocers, though largely localized. But what makes this category a strong opportunity? It is easy for everyone to relate with this category. Buying grocery is like a necessary repetitive task we do over and over again. Buying almost the same things over and over again, like a step before filling gas at gas station. Sometimes we experiment with new brands, interesting products, etc. However a large component of our purchase is what we know we have to buy. Grocery brands also enjoy a high degree of brand loyalty. We do not often change the brands we consume. It is a list based purchase with mostly identified brands, items and even packaging. Grocery buying is a clear list. We know what we need, how much we need, which brand or ‘if not that then that’. It is though an unorganized list, mostly residing in the brilliant mind of the lady of the house and seldom finding its way onto a small tiny piece of paper. And the list goes on and on for months, only to be impacted by our growth, both in age and/or in lifestyle (includes the wallet). Rarely we change a brand or packaging, and for most of the items we never do. Let us undisputed agree on this point. Be it a kirana shop or a large format store, grocery buying is a boring process. At least most of my half of the world would agree totally. § Large queues at payment counters with only a few payment counters operating even though there are several rows of them. § Very slow staff, technical glitches, bar code not matching, wrong discount, and what not. Why should we be a part of these issues, when we have selected what we want and just need to pay and fly out. § Common shelf outages. Most of us work in ‘working hours’ and shop for grocery when everyone else is also shopping for grocery. Hence common, fast moving products and brands do get shelf out very fast. § Dealing with the attitude of un-friendly ground staff, they seriously look at your like you are going to eat the chocolate and wouldn’t pay for it. Then may be people do that too. § Most importantly, the offline grocer decides what and how much they put on shelf, which brand they keep or not keep, sell or not sell, etc. and for us the moment of discovery happens right when we reach the aisle. Imaging getting out of this store and going to the next one. § Bring your own Bag (BYOB) – is a killer. To save the environment, the onus of bringing carry bag is on us. Or we pay an extra few bucks, every time we buy. And many other problems like parking, etc are universal. 2) In grocery purchase, little tiny discounts are a good drivers of shift. Online can play with this better and provide wide savings to the consumer. 3) Online can provide a very fast, easy, proactive, and engaging experience of buying online. It can actually be fun! Searching, browsing, sharing lists, making lists, doing all the maths for tiny little discounts, changing the mix, all can be easy and fun online. 4) Repetitive purchase can be a heaven. One click order of monthly refills, right from his/her mobile which driving home and suddenly catching up with the moment of truth of buying grocery. The dude becomes a superman for the lady of the house. 5) Home Deliveries, no BYOB, no nothing. 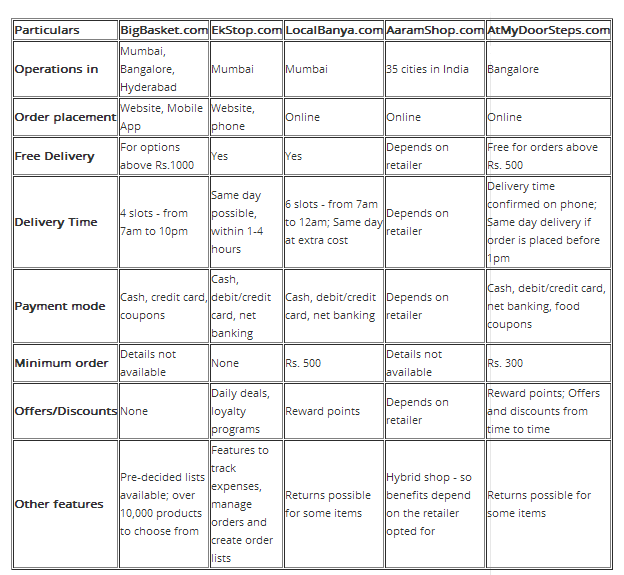 6) Cash on Delivery – anyone can pay. 2) Technology tells you all about consumers, you can even predict which household is going to be needing a cardiologist very soon based on volume of consumption of fatty oils. 3) Making them more happier by understanding their needs, providing them personalized offers. 5) Saving on cost of operation, large real estate rentals, salaries of unproductive staff. 6) High long term relationship with customer, enhanced loyalty, with continued purchase. Easy to implement reward system, more convenient for consumers, no carrying cards, remembering number etc. 7) Lack of retail penetration – one of the strong points for eCommerce in India is an opportunity for quick penetration. 8) Consumers are eventually going to adopt this medium, hence the market shall grow bigger, it is important for retailers to be prepared for same. Why is online grocery still nascent in India? Over all, the business requires higher investment, requires near customer touch point, and deals in time sensitive inventory. As a consequence of same, the online grocery businesses is an unlike eCommerce model. When this template is ready, executed successful a few times, the on-line grocer is ready to scale. Indian On-line Grocers are still in the build up phase, hence the industry poses a significant opportunity but is still nascent. Below is a table by Money Control that has aggregated around some of the different online grocery stores available in India, showing the limited reach of online grocers. Why the opportunity is bigger for offline retailers? As highlighted above, the online grocery business operates close to local touch points, it is one of the unique eCommerce opportunity that resonates greatly with offline, both in terms of growth and maturity. Hence offline players have a very strong edge over this business, they just need to think fast and create online layers over and above their existing retail business.